The National Geographic Society has not discovered ancient giant humans, despite rampant reports and pictures. The hoax began with a doctored photo and later found a receptive online audience—thanks perhaps to the image’s unintended religious connotations. 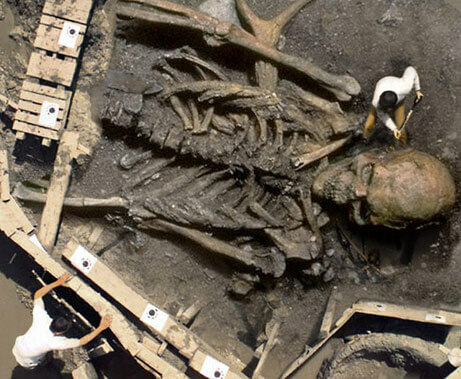 A digitally altered photograph created in 2002 shows a reclining giant surrounded by a wooden platform—with a shovel-wielding archaeologist thrown in for scale. By 2004 the “discovery” was being blogged and emailed all over the world—”Giant Skeleton Unearthed!”—and it’s been enjoying a revival in 2007. The messages come from around the globe—Portugal, India, El Salvador, Malaysia, Africa, the Dominican Republic, Greece, Egypt, South Africa, Kenya. But they all ask the same question: Is it true? Helping to fuel the story’s recent resurgence are a smattering of media outlets that have reported the find as fact. An often cited March 2007 article in India’s Hindu Voice monthly, for example, claimed that a National Geographic Society team, in collaboration with the Indian Army, had dug up a giant human skeleton in India. “Recent exploration activity in the northern region of India uncovered a skeletal remains of a human of phenomenal size,” the report read.